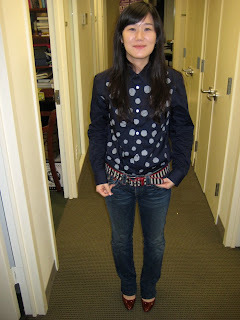 And this is a size 8, which is big for her, but it still looks great on her. I'm proud to say I bought this and she drooled over it so, naturally, it had to be hers. But don't think I'm some kind of saint because I was going to return it anyway. 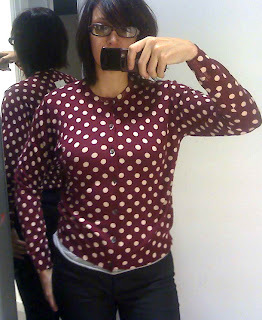 Size medium, red polka dot CdG for H&M cardigan. Just comment on this post, because I can't think of anything good for a contest. If I was a web tech person I'd design online games for us bloggers, like those crane games at carnivals that torture little kids and never pick up the dang stuffed animal. My husband and I used to play one at our laundromat endlessly and it would bark at us: "There's no limit to what you can win!" Wrong, we almost never won. But the one time he actually got a stuffed animal, he gave it to the toddler had been watching him play, mesmerized by his superior crane technique. Instant deification/gratification! If you're a regular commenter and link to this post on your blog, I'll put your name in the pot 3 times. Although that will make it more difficult to win, so proceed with caution! The commenting section will be open till the end of the day on Sunday, and the winner (chosen by a drawing) will be announced Monday. update: I'll even ship this one overseas, so this is open to all. & update: be sure to let me know if you link, just in case I'm behind in reading. My He-weasel is good at the crane game, unhappily. Then he wants me to forever keep the bright blue teddy bear he won when we had breakfast at that place in Big Bear. Your lovely sweater is MUCH better than a stuffed animal that comes from the claw of the crane. Hi there-yippee, this sounds good!! I don't win competitions generally, so I'll keep my fingers crossed here, haha!! Ooo that looks lovely, I still need to go down to H&M and peruse over whatever is left over! Red AND dots? I am one of the few who could care less that it's CdG, but since it's adorable ... count me in! I love this belt on the first item. Your blog is so cute. I'm sort of new so I'm looking for some cool blogs. I really like yours :D thanks for posting. CdG red with dots what can be better????? Am I eligible, even though I won once before? Yes, enc, all are eligible! you won ages ago. Ooh Can I join? I don't think I'll have much luck (the only thing I won in raffles is soap..erm...) but I'll give it go! Oh Miss Fashion, we are so loving your giveaway! You always have the best goodies!